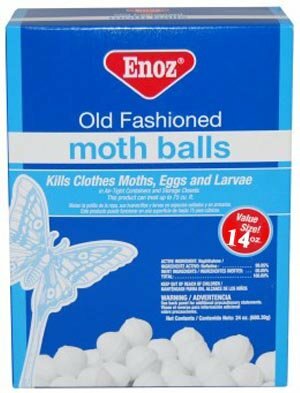 Enoz Old Fashioned Moth Balls preserve clothing and other materials by killing clothes moths and carpet beetles and their eggs and larvae when used in air-tight containers and storage closets. A must-have household product! Place in your closet or storage area to protect your clothes. The mothballs in each container can treat up to 12.5 cu. Ft.
Pantry moths destroy your food. They come from grocery stores and other trusted placed outside your home, then create chaos inside your home. They are a silent problem that will not go away easily. Once you see them, the only course of action is to break their mating cycle to get rid of them. 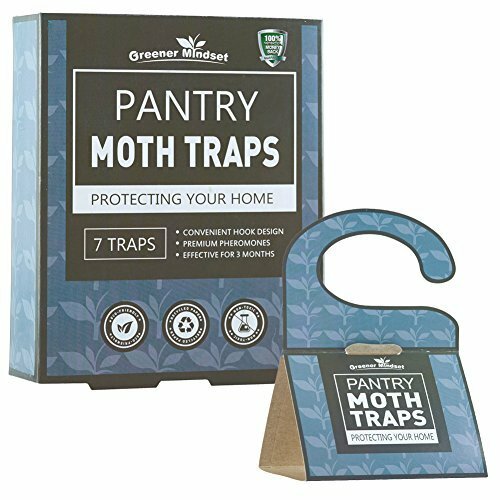 Our Greener Mindset Pantry Moth Trap is the most effective trap on the market designed spefically to eliminate pantry moths. Our Patent Pending Hook Design make this trap the only one of it's kind to literally go anywhere in your pantry, cupboard or wherever dry food is stored. Hang our trap in hard to reach places or place our trap on any flat surface. 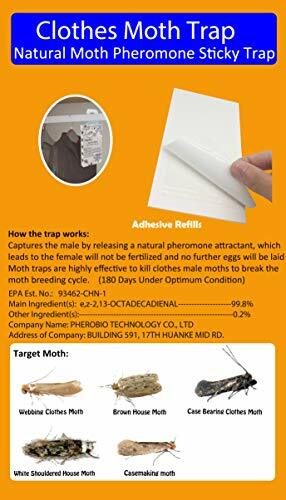 Benefits: - Can be hung or placed anywhere - Strongest natural moth pheromone attractant available - Odor free, non-toxic, pesticide free, no moth balls - Child safe and pet safe - USDA and EPA approved - Made from recycled materials - Protects your food from contamination How does it work? Our Pantry Moth Trap contains premium female moth pheromones mixed into very sticky glue that attracts male moths. Once the male moths become stuck to the trap, the mating cycle is broken and the females will be unable to reproduce. How to use the trap? Instructions are included on the box and each individual trap. Simply remove the safety film from the trap, fold and connect. The patent pending hook feature allows you to hang the trap anywhere or place it anywhere. For heavily infested areas it may be beneficial to use multiple traps at the same time. This trap is designed to catch adult male moths only. Replace each trap once it becomes full or after 3 months of continuous service. Clothes Moths destroy natural fibers in your clothes, bedding, linens and animal fur. Because these moths live in dark places, you don't know they are a problem until your expensive items have been destroyed. Our clothes moth trap uses natural moth pheromones to eliminate these destructive moths, preventing the damage of your home. We offer an innovative patent pending hook design that allows you to hang the trap anywhere in your closet or place it one shelf, floor or any flat surface. This feature allows you to place the trap in places where other traps can't go. 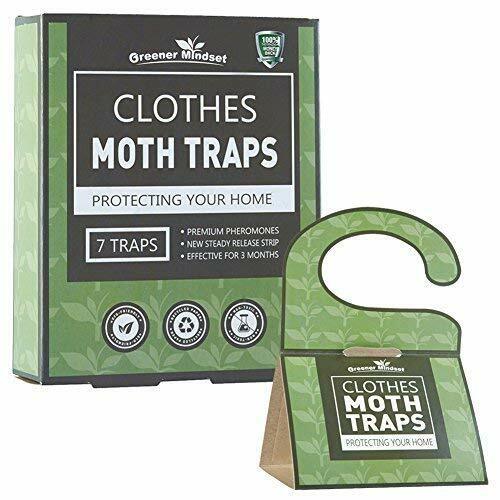 Our traps prevent clothes moths from laying their eggs on your clothing, carpet, upholstery and furnishings. Our clothes moth traps are odor free, pesticide free and non-toxic. They are also pet safe and child safe and a much better alternative to moth balls or harmful pesticides. How does it work? Our Clothes Moth Trap contains premium female moth pheromones mixed into very sticky glue that attracts male moths. Once the male moths become stuck to the trap, the mating cycle is broken and the females will be unable to reproduce. How to use the trap? Instructions are included on the box and each individual trap. Simply remove the safety film from the trap, fold and connect. The patent pending hook feature allows you to hang the trap anywhere or place it anywhere. For heavily infested areas it may be beneficial to use multiple traps at the same time. This trap is designed to catch adult male moths only. Replace each trap once it becomes full or after 3 months of continuous service. What do they catch?? 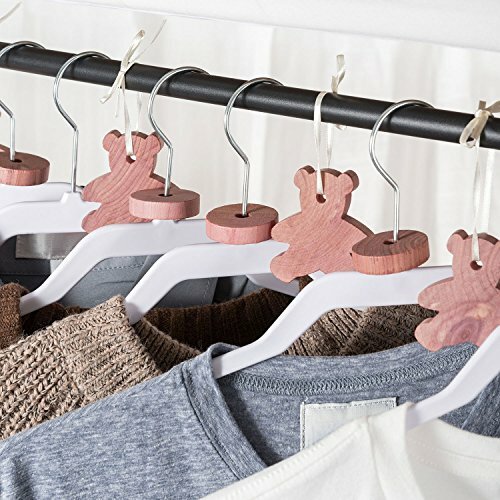 These traps are designed to catch the common clothes moth and webbing moth known as Tineaola Bisselliella that eats your clothing, wool and any other items with natural fibers. The trap also targets the case bearing moth known as Tinea Pellionella that eats your carpets, fur, upholstery and wool. PURE NATURAL AND HEALTH MATERIALS - Made from 100% natural North American aromatic red cedar without adding any chemicals, effectively absorb moisture and odorsuse protect your valuables and clothing. LONG LASTING FRAGRANCE - The original scent of the cedar is light and lasting so you may only smell the fragrance when placed under your nose, but it does not affect the effect. To refresh the cedar wood, polished wood surface and them the scent will be strong again. 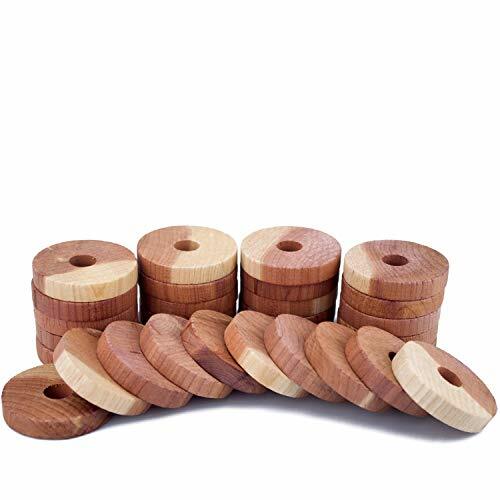 HOUSEHOLD GOOD HELPER - These cedar rings give a pleasant forest scent, keep your clothes smelling fresh, as well as absorb moisture and odorsuse in your closet, it are well made that doesn't scratch delicate fabrics can direct touch with sweaters, wool clothes. EASY TO USE & MULTIPLE USAGE - Include: rings x 30, hang up on hangers, placed in drawers, lockers or laid on shoe cabinet & storage bag, cars. ideal for closets, cupboards, drawers, shoe cabinets, cars or anywhere in your home. WORRY-FREE AFTER-SALES SERVICE - We strive to provide the best experience for customers. If you are not satisfied with our products, we guarantee 100% free refund within three months. Let you risk-free purchase. These catchers target Webbing (Common) Clothes Moth (Tineola bisselliella), Case Bearing (Making) Moth (Tinea pellionella), White Shouldered House Moth (Endrosis sarcitrella), and Brown House Moth (Hofmannophila pseudospretella). 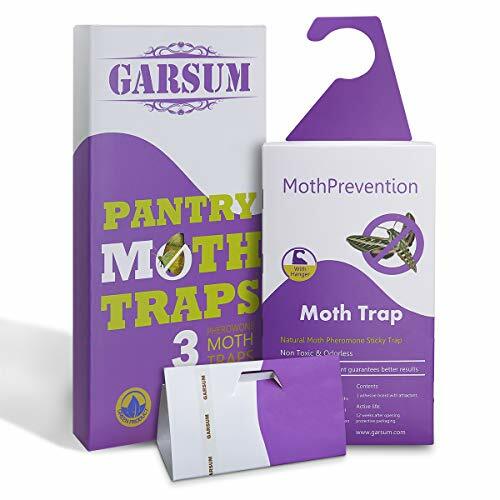 LARGEST, FASTEST WORKING MOTH TRAPS - READY IN SECONDS: Simply open, peel, and fold - premium pheromones do the rest, magnetizing every moth away from your valuables and into your clothes moth trap - easy as 1, 2, 3! IMPORTANT! STINK FREE, NATURAL & PROVEN SAFE - While most moth balls for closet and moth traps use stinky, dangerous chemicals our German-made natural moth traps closet clothing pheromones provide 100% SAFE PROTECTION, WITHOUT stinking up your favorite sweaters! THEY WORK, PERIOD - RISK FREE, 90 DAY GUARANTEE: We are confident our Clothes Moth Traps with pheromones WORK and our customer service shows it! You'll feel 100% satisfied with your clothes moth trap - the #1 best clothes moth killer - or get a full refund within 90 days no quibbles, no fuss! 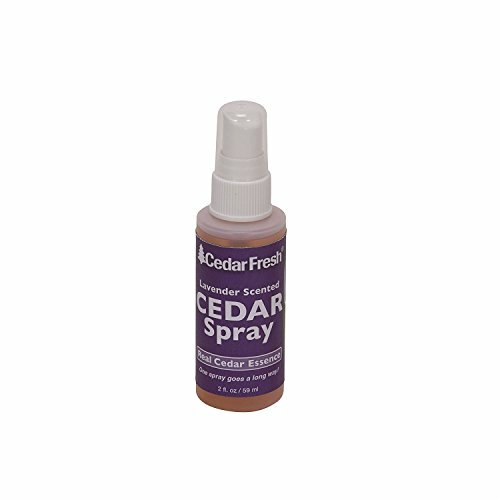 Household Essentials CedarFresh 84802 Cedar Power Spray with Lavender Essence Scent - Protects Closets from Pests - Restores Scent to Cedar Wood Accessories - 2 fl. oz. If you too are one of the people who still appreciates the quality and finishing touch of the luxurious cedar wood, then we have the perfect item for you: Colton s natural cedar spray. With a unique scent and fiber restoring properties, this cedar spray will make your wooden accessories gain back their fresh odor. Because it s an easy and inexpensive alternative for taking care of your cedar wood accessories. With pest repellent properties and a fresh cedar & lavender aroma. This premium cedar spray was a completely natural formula, so you can protect your cedar wood pieces without harsh chemicals that might hurt the environment and the wood itself. 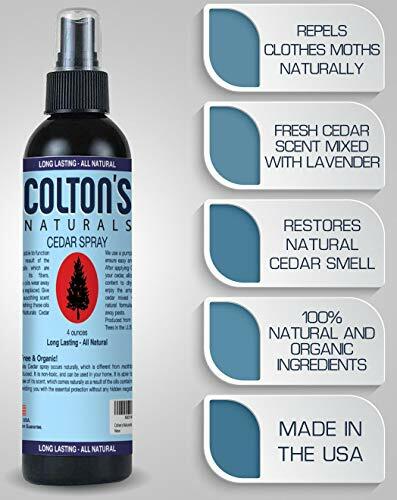 Colton s natural cedar spray Fiber oil renewal With lavender essence Discrete and fresh scent Restoring shine Pest repellent properties 4 oz bottle Easy to use 100% natural Eco-friendly ADD TO CART NOW and take care of cedar elements with a simple and effective lavender spray! NATURAL PEST REPELLER: One of the main features of this cedar wood spray is its action against pests, so moths and spiders are no longer an issue for you. Moreover, the spray is made with natural ingredients that don't hurt the pests, so this solution is eco-friendly. EASY TO USE: All you must do in order to ensure protection and revival of the natural aroma in the cedar wood is spray a small amount of product and let the wood piece dry completely. This way, you will enjoy premium protection for your cedar pieces, all from a 4oz special spray with a nice Cedar & lavender flavor. GREAT SCENT: Although the cedar wood naturally has a special flavor given by the inter-fiber oils, we have added a hint of lavender extract to enrich that luxurious aroma. This way, you will get that same effect from your grandma's cedar closet, bringing back timeless memories. 100% NATURAL: Not only is the Colton's cedar spray effective in protecting the cedar wood from dust, impurities and pests, as well as rehydrating the oil fibers, but it is all completely natural, using no harsh chemicals, and thus having no harming side effects. Bring home the freshness and fragrance of the outdoors! The Cedar American Aromatic Scent Blocks bring a piece of the outdoors into your living spaces! The unique power of cedar wood absorbs moisture and eliminates mildew and fungus. The natural wood also acts as a natural insect repellent, keeping away moths and other insects. Cedar blocks also deodorize the air and refresh the aroma in your cupboards, closets and storage spaces. NATURE AT HOME! Natural Cedar wood blocks (each measuring 3.5 x 2.5 x 0.3 inches) that deodorize and refresh! Leave your living and storage spaces smelling fresh and outdoorsy. Sanding helps to smoothen rough edges on blocks and also refreshes the blocks and makes them extra aromatic. POWERFUL DEODORIZER: Cedar blocks absorb odors and eliminate them, leaving behind a fresh, outdoorsy scent that refreshes the mind and calms the body! 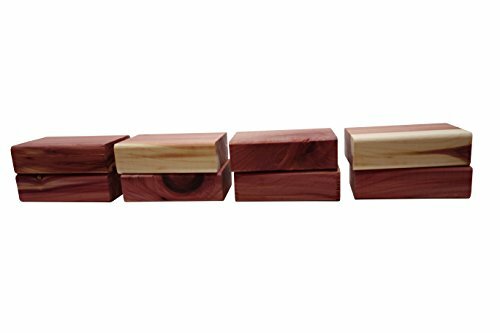 NATURAL INSECT REPELLANT: Cedar blocks are a natural insect repellent, and keep away insects and pests such as moths and other bugs. ELIMINATES FUNGUS: Cedar blocks absorb moisture and eliminate mould and mildew, protecting your valuables and clothes. BUY AMERICAN! These cedar blocks are proudly grown in Columbus Ohio! MADE IN USA! Powerful, Natural, Odor-Free Carpet And Clothes Moth Traps will help you deal with moth infestation in no time making sure your lovely sweaters are safe and sound. With our Anti-moth traps you will get rid of clothes moth really quick with the long lasting effect. Clothes moth traps are easily installed and folded - once they are put in the wardrobe you won't have to check it again and again. Moth traps are odor free and won't make your belongings stink. Anti-moth traps attract the moths by moth pheromone which is a natural way and is proven to be harmless for humans and pets. The moth will be kept only on the moth trap surface, and no other bodies to be found on the shelves and between the clothes piles. Our Brand Cedar Space In the more than ten years since the establishment of CEDARSPACE, we have never stopped exploiting the value of cedar wood in line with the principle of "nature is the best". 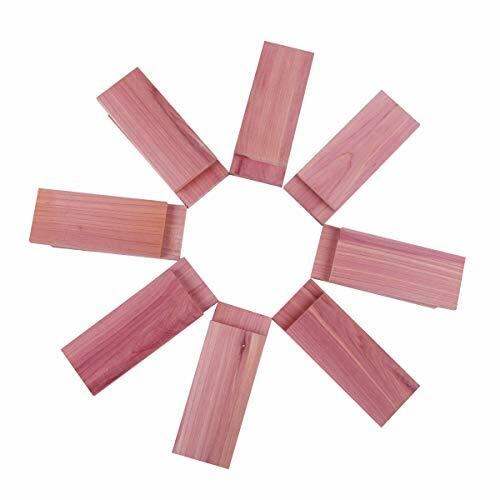 The properties of cedar wood make them ideal materials. Whether at home or on a trip. We hope that our products will always accompany you and bring you as much care as possible from nature. So we have designed products of various sizes, they are all pure natural products without pollution and additions. In various occasions, our products can certainly meet your needs and show their functions. This is our first step and we have achieved great success. In the meantime, we continue to research and improve our products. Considering the differences of each family, we also design different packaging methods for different product quantities. In order to reduce the waste of resources, we simplify the packaging so that its cost is not wasted on the packaging. So we can sell better things at a lower price. PERFECT SUBSTITUTE - Cedar wood is the perfect gift of nature. Enjoy a healthy, natural life. INTIMATE PRICE - In the communication with customers, we realize that because of the particularity of each family, a single number of products can not meet the needs of a family. So we designed different quantities of packaging and then sold them at a more favorable price in order to allow more families to be protected and cared for. PROFESSIONAL PRODUCT - Through the analysis of the data of various family cabinets, we finally determine the cedar accessories you see, cedar balls, cedar chips, cedar rings, cedar hanging boards, cedar shavings. These products can be used in any household storage system. EXTENSIVE USE - Carefully designed cedar accessories products, can be directly placed in drawers. No matter which one is mentioned above, it is pollution-free and will not damage any material of clothing. The light fragrance is fresh and comfortable. In the following product introduction, we will introduce the wide use of different products in detail. THE SAFEST PURCHASE - All cedar products are made of the best quality cedar wood, 85% of which is core wood. Only after simple cutting, polishing, safe and natural. If there is any doubt in the use process, our professional after-sales stand by at any time. In addition, you can get 100% full refund without any reason. This natural non-toxic clothes moth trap is a pheromone sticky trap to catch, monitor and control infestations of clothes moths. 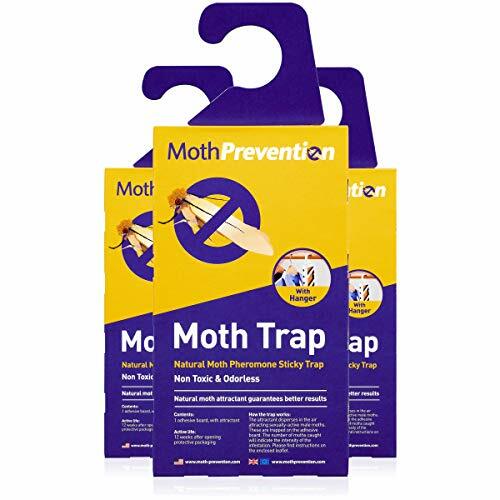 Use our moth traps to stop clothes moths laying their eggs on natural fibres, wool, silk, cashmere, clothing, carpets, materials, soft furnishings and upholstery. Without Moth Prevention Clothes Moth Traps moth larvae feed on natural fabrics resulting in expensive damage. The clothes moth trap sticky strip is a natural moth killer that works through being impregnated with a natural attractant in the surface. Male clothes moths become stuck to the strip, enabling you to monitor the seriousness of your moth problem, break the breeding cycle and get rid of clothes moths. This natural pheromone trap mimics the scent released by the female moth to attract the male. It is specific to this type of moth and will not attract other species. This moth trap is proven to have the best catch rates for clothes moths and textile moths on the market! POWERFUL PREMIUM PHEROMONE: Captures the male by releasing a natural pheromone attractant, which leads to the female will not be fertilized and no further eggs will be laid. Moth traps are highly effective to catch clothes male moths to break the moth breeding cycle. 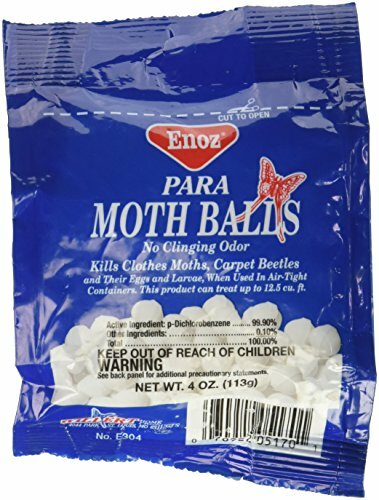 ODOR-FREE & NATURAL AND SAFE: Health is more important than anything else.For the health of your family, please give up the harmful and inferior moth traps and moth balls,Dangerous chemical products have a lot of potential damage to your body. MOST EFFECTIVE MOTH TRAPS: Clothes moth pheromone catching target is Webbing (Common) Clothes Moth (Tineola bisselliella), Case Bearing (Making) Moth (Tinea pellionella), White Shouldered House Moth (Endrosis sarcitrella), and Brown House Moth (Hofmannophila pseudospretella). LONG-LASTING PROTECTION: We installed the pheromone in the glue to make it Quick results .Three months of product life after opening the aluminum platinum bag and tearing the protective paper. 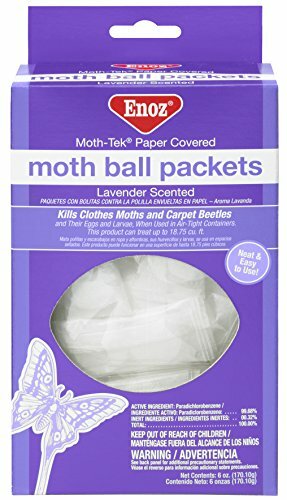 For use with my store clothes moth traps box ,7*4 in .No need to remove closet items.